"If there is nothing more on BS01, it is because no other info exists." BIONICLEsector01, or BIONICLEsector01 Wiki is the largest and most accurate BIONICLE reference site and wiki on the Internet. The BIONICLEsector01 Wiki was launched the 5th of October 2005 by Crystal Matrix. In the beginning, the wiki was absolutely barren, with nothing aside from the standard wiki software additions. Shortly after, the site began its slow construction through the dedication of about half a dozen of members. The amount of members eventually grew dramatically, and the amount of work done also increased. 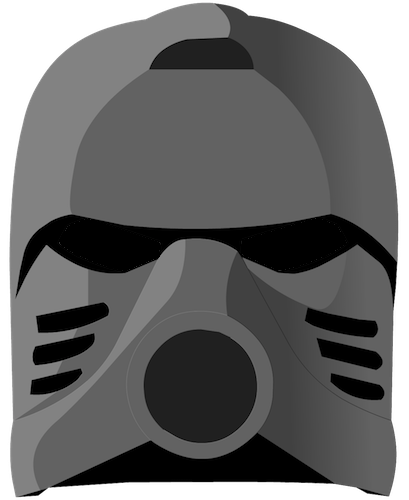 By the time of February 2006, the wiki already had almost every piece of information regarding the BIONICLE universe from 2001-2006. The works from these early editors would eventually set the base for the wiki today. With the base of the wiki completed, the wiki had become a reliable source which the BIONICLE fandom trusted. More and more editors and viewers came, and the popularity of the wiki grew. A tight and friendly community was created among the members. All was well. On April 1st 2006, former owner and creator of BIONICLEsector01 suddenly announced his retirement from the BIONICLE fandom. The sudden announcement shocked the entire BIONICLE fandom, and many thought it was some sort of April Fools joke, which it was not. Consequent to his departure, The Kini of Crystal Matrix was set up in memory of the great Crystal Matrix, whose work had brought a complete encyclopedia of BIONICLE information to the entire world. The first Main Page Redesign Contest took place during the first Golden Age. The purpose of the contest was to allow members to design a main page for the wiki, with the winning entry to be used for the main page. The contest was a somewhat welcomed one, and several designs were submitted. In the end, BIONICLEsector01 technician Epsilon won the contest with his "2001" theme main page, which was used until the second Main Page Redesign Contest. Around June 2006, the two sites of BIONICLEsector01, along with its then sister site BZPower, went down without warning. The communities of BZPower and BIONICLEsector01 were both surprised by this sudden downtime, and the BZPower admins rushed to solve the crisis. Both of the sites returned shortly, only to crash again. The process repeated itself many times until both sites stopped working entirely. After some troubleshooting by the BZPower administrators, it was decided that BIONICLEsector01 was overloading BZPower's server, and thus BIONICLEsector01 had to detach from BZPower's server and fend for itself. With no help or server available, BIONICLEsector01 was left to drift. At one point, fansite TBoM attempted to extend aid by hosting BIONICLEsector01 on their server, but the idea was never placed into action. By early 2007, the situation looked hopeless. Desperate, an idea was formulated that BIONICLEsector01 would be combined with BZPower, wiping BIONICLEsector01 out of existence and replacing the content as topics on BZPower managed by BZPower's reference team. When the plan was announced to the Wiki Staff, most of the members disliked the idea, many strongly argued against it, and suggested the idea of donations. Furthermore, two members who heard of the details of the plan were petrified with horror at this plan and desperately argued and begged against the doomsday idea, suggesting that they would help with the funds for a new server. Thankfully, Swert figured out that it was not necessary, and that the pair managed to persuade him. He scrapped the idea and shortly afterwards, Swert decided that it was time to buy a server himself, and thus BIONICLEsector01 was saved, temporarily. 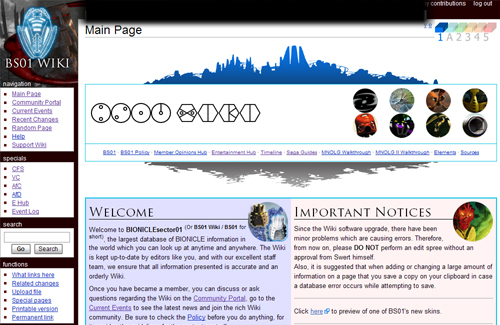 With the wiki back up on a new server purchased by Swert, members of the BIONICLEsector01 and BZP community were rejoiced and rebuilding (adding all the information back from backups) took place rapidly. However, the celebrations and efforts did not last long. Less then a month after the purchase of the new server, BIONICLEsector01 was hit by swarms of downtimes once more. Very soon, the server had become incapable of hosting BIONICLEsector01, and BIONICLEsector01 was forced to drift once more. Yet another disaster struck the drifting site. Unlike the previous backup, the manual backup was not fully complete. With the technical failure of the software backup, all the edit histories, including the histories of the first pages and edits, and many pages were gone forever. 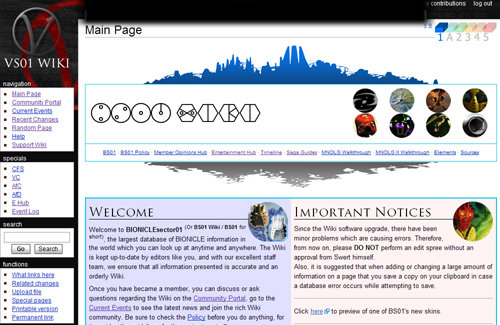 The site drifted around the net for many months until finally, a few weeks after the second birthday of the wiki, an anonymous buyer purchased a stable server for BIONICLEsector01. After more then a year of downtime, BIONICLEsector01 finally returned, and was ready to provide the BIONICLE community with accurate information once more. The wiki has come a long way. As information rolls in, it's completely perfect after a fortnight (exaggeration). 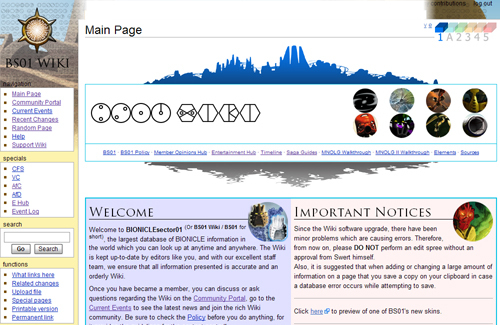 The wiki has had time to expand and grow, and new hubs have been created. The Second Golden Age had begun. The second Main Page Redesign Contest was similar to the first Main Page Redesign Contest, where members designed and submitted designs for the main page, with the winning entry used. The contest received much more entries then the first contest, and the voting was a heated race. In the end, Bioran23's "Flabbergasting" design won the contest with a landslide victory. BIONICLEsector01 then entered a unique age, where skins were finally installed on the wiki. After hours of research, trial and error, and even a couple of minutes of crying and panic on the part of the owner, BIONICLEsector01 gained a brand new skin based on a test Swert made. It was called "Karda Nui." Later, based on the 2008 prank, two more skins were made, named "Empire" and "VS01." Later, as an introduction to 2009, another skin was created which features a background of Bara Magna. On January 1st 2009, a new skin was introduced. This was the "Reign of Shadow" skin, and it was previewed as far back as December 22nd. All six skins, as well as the classic "Monobook" skin, are available for use right now. * Binkmeister did provide BIONICLEsector01 with the background, but he did not create it, therefore he is not listed here. ** SPIRIT did the initial stage of the logo. In March 2008, a member named Toa V began displaying unusual abilities within the database, and started warning other members that the staff had been corrupted by the owner Swert and were forming an empire. Various hints were given through a terminal controlled by V, who communicated through a White Ussal. Simultaneously, information was given through "Gears" posts by Swert, who began behaving in a tyrant-like fashion. Members chose various sides, deciding to side with V, Swert or remain neutral. In addition to his different behaviour, Swert changed the default skin to a darker "Empire" skin. At the climax, V appeared to triumph, changing the skin to a "VS01" skin. However, it was revealed that V was actually Swert, and that the entire affair had been the building up of an April Fool's Day prank. All changes were reversed, excepting the removal of the ability to move pages from members, as it had been a common weapon for vandalism. As the wiki continued to improve in terms of levels of organization and high quality content, several projects were developed to encourage a sense of community and working together towards common goals. The largest and most successful of these initiatives was the Operation:Restore All Content, or the O:RAC project. It identified pages that needed images, quotes, links, and pronunciations, among other things, and enlisted regular contributors to find them to bring the pages up to the wiki's high quality standard. Although O:RAC was not completed, it effectively eliminated the Pages Requiring Attention section of the wiki and was largely responsible for the wiki's current splendor. Another project which encouraged a sense of community was the Event Log, which recorded the daily activities of the wiki and major changes made to it on any given day. The Articles for Deletion and Articles for Creation also greatly assisted in establishing a community atmosphere, allowing members to vote on the creation or deletion of articles based on the members' opinions of the proposals' relevance to the wiki. In early April, a comic was released and the Monobook skin was changed to a tower in the middle of a desert. According to the first and following comics, which featured Swert, Moutekea and others, Wiki Nui had somehow ended up in a desert instead of the normal sea. These introduced a game for members, called A Change of Space, in which they had to track down clues to reach an answer, for a prize of being featured in story about the event. A few more comics, including a prank one, were released, but due to real life events, Moutekea, who was organising the game, was unable to continue, leaving it on a cliff-hanger. In the fall of 2009, copious amounts of mainspace, user page and talk page revisions contributed to a surplus in server volume, which threatened to cause the entire wiki to be deleted. The then-current revisions of each page were backed up, deleted, and then subsequently restored to create more room. This undertaking was largely successful, although the unfortunate side-effect was the erasure of users' sub-pages and talk pages and that the loss of image pages resulted in all images becoming Wanted Files. In the aftermath, the ever-dedicated members of the BIONICLEsector01 community pooled their energy into ensuring that the wiki's former glory was restored by doing everything from recreating image pages, categories and user services to continuing to empty the maintenance categories of the O:RAC. In late 2009, the BS01 podcast was launched. Hosted by BIONICLEsector01 moderator Kraahlix, the podcast features BIONICLESector01 staff members (as well as a non-staff guest occasionally) discussing BIONICLE. The various segments include News, Comic Discussion, OGD in brief, Topical Discussion, and a Listener Q&A segment in which the staff discuss questions asked by BIONICLESector01 users. On March 2, 2010, O:RAC was disbanded in favor of a new project known as Maintenance, led by BIONICLESector01 staff members Kraahlix, Shine, and Master of the Rahkshi. Although Maintenance functions similarly to O:RAC, new features such as the Featured Project and Miscellaneous Tasks were created for it. April Fool's Day 2010 featured a prank in which Swert resigned as the owner of BIONICLEsector01, naming BIONICLEsector01 Advisor Kayru as his replacement. Kayru then proceeded to add a new skin, 'KayruSkin', and declared the beginning of the 'KS01 Empire'. After being fired by Kayru, BIONICLEsector01 Moderator Bioran23 became the center of a resistance movement, and the members took sides, declaring their allegiance to either Kayru or Bioran. All changes were reversed the next day, when the prank ended. After the cancellation of BIONICLE in 2010, BS01 retained a low, but steady level of activity through the actions of a handful of users. The intervening years saw not only the founding of HEROSector01, but also the start of the yearly MakutaFest podcast collaboration between BS01 and TTV, as well as the beginning of partnerships with foreign language BIONICLE wikis Chronist-Wiki (German),and Nuvapedia (French). Unfortunately, they also saw BS01's biggest data-loss since the era of the Great Downtime and the Erased all the way back in 2007. As these years dragged on, BS01 rebuilt and remodeled on a skeleton crew of staff and editors, but in late 2014 the site felt a resurgence of traffic and interest as hints of the return of BIONICLE swept through the community. A few new users joined and some old stopped by for a visit, eager to see what kind of future the new line would hold. After the official LEGO announcement in September 2014, wiki users and staff began considering ideas on integrating the new information, ways of keeping the lines separate but together, and even a new wiki skin to help bring the wiki into modern times. Barely two months later, BS01 was named a LEGO User Group and launched its own Facebook and Twitter pages as part of the preparation for the new year and new generation of the story. In March 2011 the staff began to build the HEROsector01 Wiki, a new project that would chronicle LEGO's new toy line HERO FACTORY. It was unveiled as an April Fool's Prank, the suggestions being that BS01 would be prankless and then that HS01 would completely replace BS01. The new site was unveiled on April 2nd. In December 2011, the wiki began to experience brief downtimes. An attempt to back-up both BS01 and HS01 was led by Staff Member Cholie, but while HS01 was fully saved BS01 was not. After a server move (which had been planned previously, but was moved up in response to the downtimes) the recovery effort began. HS01 was revived very quickly, but it took BS01 a few days over a year to recover all of its Mainspace, while several images remain missing. During the events of the Second Great Transition, April Fool's Day featured a prank that was meant to encourage Swert to upload Wanted Images. User:Derpy Hooves came to BS01 and started "re-uploading" pictures, but instead of up-loading images from BIONICLE, uploaded images from My Little Pony: Friendship is Magic, an animated series produced by Hasbro Studios. The prank did not last long, and it was revealed that the Derpy Hooves account had been under the control of Staff Member Cholie and Advisor SPIRIT. Names in bold refer to current staff. Many of BS01's skins feature rock lyrics in the Matoran alphabet. The Monobook and Refreshed skins feature the lyrics to the Pink Floyd song "Shine On You Crazy Diamond." They were originally meant to be a tribute to Swert's late friend Puma, but they evolved over time to represent more, including a stylish background. The former "Empire" skin featured the lyrics to the song "Rockstar" by the band Nickelback. The lyrics were picked because of the Empire's theme. Swearing was removed from the lyrics to match BIONICLEsector01's audience. The former "VS01" skin also had Pink Floyd lyrics in its background. The lyrics were a combination of "Brain Damage" and "Eclipse." Both songs are from The Dark Side of the Moon. The lettering in the former "Arena.09" skin was the lyrics to the song "Indestructible" by American rock band Disturbed. The song was chosen due to the theme of 2009. There are currently 1,240 members. There are currently 1,458 articles. 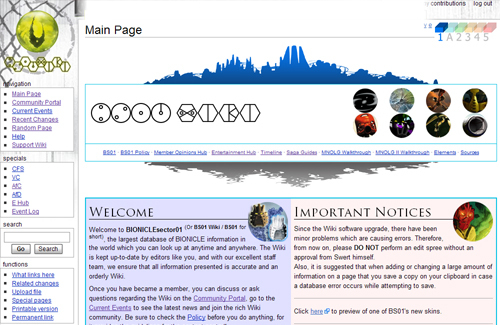 BIONICLEsector01 Wiki currently runs on MediaWiki Version 1.31.0 (0e6e155). This page was last edited on 29 March 2019, at 04:47.